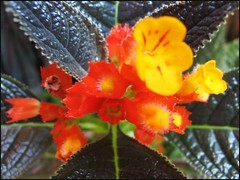 Plant type: Indoor or outdoor flowering plant. Clump-forming shrub of low to medium height. Brief plant info: Prefers partial to full shade and moderate water regularly. It must be planted in well-drained soil, otherwise tendency to root rot. Also, do look out for mealy bugs that love to infest this attractive plant. The plant forms tubers at the base of the stem and sometimes also in the leaf axils. You can propagate by dividing the tubers or from stem-cuttings. 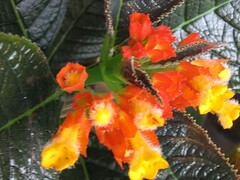 More plant info: Check TopTropicals for more information and lovely images. Such a fascinating plant! 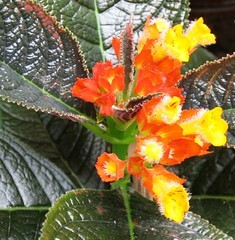 The beautiful colours of its leaves and flowers perfectly match each other. Its leathery textured foliage are large, dark green with a coppery-tint and are held in usually upright and thick succulent stems with very showy orange-red bracts which are long lasting and cupping lovely sunshine yellow flowers. It is very ornamental when clustered in any container or even grown on ground in garden beds or borders, either mass-planted or mixed with other perennials! Also, well suited as a houseplant or in greenhouses as it doesn’t like strong sunshine but loves to be in semi-shade with filtered sun.